Noron's Keep is an isolated stronghold near the source of the Kald River in the Sorkin Mountains. The keep is held by Noron, one of the semi-divine creatures known as Pradeyalkri. Noron is held in awe by the Taeldan tribesmen who live in the surrounding wilderness, and an implacable foe of the Gargun (Hârnic orcs) whose colonies are found in the mountains nearby. Noron and his sons are known to extract exorbitant tolls from travelers on the trail between Tonot in Kaldor and Shese in Orbaal. 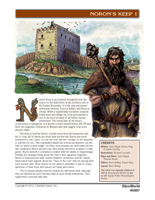 The Noron's Keep article describes Noron, his keep, and his sons. It provides information about some of the village's residents and two other Pradeyalkri. It includes full-color GM and player maps as well as floor plans for the keep. This is a Hârn Classic article and was originally published in 1985 as part of Encyclopedia Hârnica 14 and in 1987 as part of the Orbaal Kingdom Module.